The Central Government's argument that what is happening in Sri Lanka is an internal affair of that country is not agreeable to the Communist Party. If so, why the former Prime Ministers, Nehru, Sastri, Indra and Rajeev from time to time signed several pacts on the internal matters of Sri Lanka, Pandiyan asked in the press meet at Balan House, the party's office, reported Janasakthi, the party newspaper. The Indian government team led by Pranab Mukharjee, intending to go to Colombo for talks has to include at least two Tamil Ministers or MPs. The Indian government should make it a practice to appoint Tamil High Commissioners to Sri Lanka, Singapore and Malaysia, the CPI leader opined. 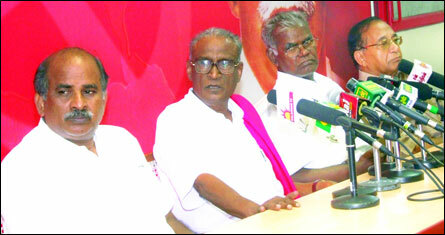 CPI central committee will discuss stopping military aid to Sri Lanka on 1st and 2nd of November. The All India students Front will press for stopping war in Sri Lanka in a national level agitation in front of the Parliament on November 14th. Hundreds of students will be traveling in an exclusive train to Delhi to participate, he said. He requested the people of Tamil Nadu, especially the communist party members, not to celebrate Theepaava'li to sympathize with the plight of Eezham Tamils. On the arrests of the film directors Seemaan and Amir his response was that there should be allowances for the emotions of artists. The CPI central committee member R. Nallakannu, Tamil Nadu Joint Secretary S. Mahendran and committee member A.M. Gopu were present during the interview.